Though your resume may look spot on and demonstrate you have the right type of experience and education, upon closer inspection, a potential employer may see there are gaps between your positions. Short spaces of time (i.e. one to three months) are explainable; usually, it takes a while to find a new job or relocate for your new position. 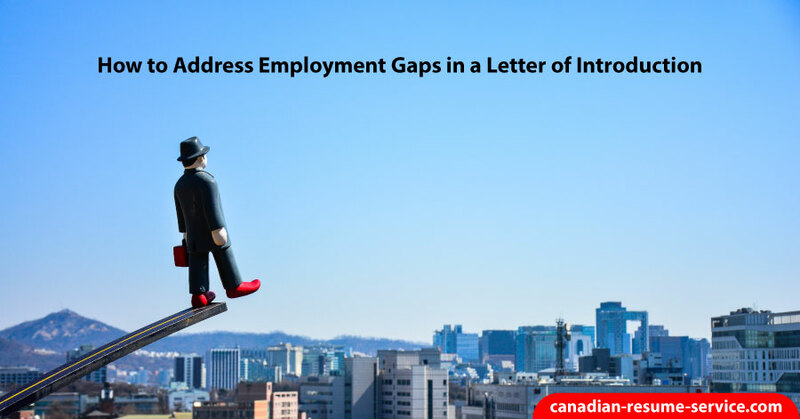 Otherwise, use a letter of introduction to address employment gaps. It’s the more significant gaps of time or the re-occurrence of large gaps that worry employers. They wonder if you are reliable or just a job hopper. If you have numerous jobs you only spent a few months at, then they would classify you as a job hopper. If you might be considered a job hopper, it may be a good idea to leave some of your shorter terms out of your resume. If you held a full-time job and a short-term position, this does not convey the same message as job hopping. It’s okay to leave that short-term job on the resume, provided it’s relevant, and you have extra space. The cover letter provides an excellent opportunity to explain holes in your work history, particularly if you are returning to the workforce from several years of leave. There are many reasons a person may need time off: medical (self or family member), education, the birth of a child, or choosing a different career path. Your reasons are your own, and to you, they were important. Some employers may not view these reasons in the same positive light. Every one of us can relate to severe illness or death of a loved one. Employers should be compassionate enough to understand they needed to take a few years off to help a disabled parent or spend some time with a terminally ill loved one. “I left the workforce from 2014-2015 to assist my aging father. Since then, he has moved to the appropriate care facility. I’m now able to get back to my career and give it my full attention”. Explaining you were out of the workforce for two years to complete your Master’s Degree is quite easy, and since having a higher education is an admirable trait, mentioning it again in your cover letter will not hurt. On the other hand, here are some tricky topics that should seem pretty straightforward, but do require a bit of finesse. Not everyone will place a stay at home parent as a top job candidate. Or they may be left wondering if you’re going to take an extended leave if you have another child. Use your cover letter to address this issue right away. You could write that where you lived there was no chance at hiring a babysitter; the primary schools had a horrible reputation, so you thought you would give them a good education at home; you wanted to spend the first few years with your child, as they are the most precious years. After giving your reason, you want to assure the potential employer you are 100% committed to returning to the workplace and are excited and eager to return to your dream career. This phase can happen at any age. It may occur during your college or university years or once you are into your first or second career. There is nothing wrong with taking some time to find yourself and developing the traits needed to succeed in your chosen field. A few employers may think you have your head in the clouds, don’t know what you want, or will end up leaving this job after only a few months because it wasn’t the right fit either. In your cover letter, explain you had been working toward X career but realized it was not as rewarding or enjoyable as you thought it would be. After researching, you determined what role would make you happy and begin this new career path.